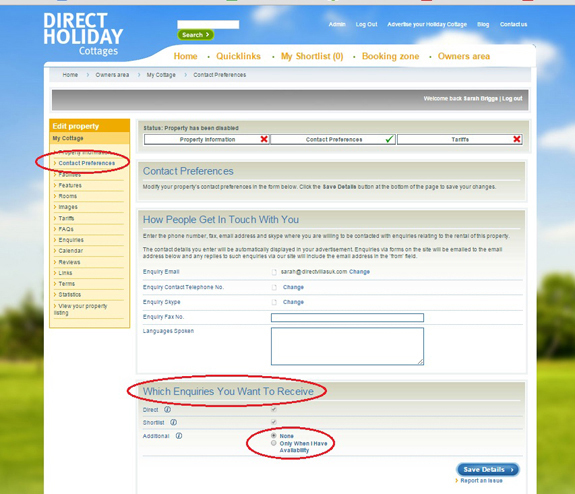 When a holidaymaker requests a quote from your holiday home on www.directholidaycottages.com, you will get a notification by email letting you know the enquiry details which will be clearly marked as one of 3 types – DIRECT, SHORTLIST or ADDITIONAL. The Enquiries section in your Owners Area also gives details of enquiries sent and again they are labelled here as one of the 3 types. If you take a look in your Owners Area you have the option to choose your Contact Preferences and the enquiries you’d like to deal with. By default you will receive Direct and Shortlist enquiries generated by your advert. These are the hot leads resulting from a viewing of your actual property details. 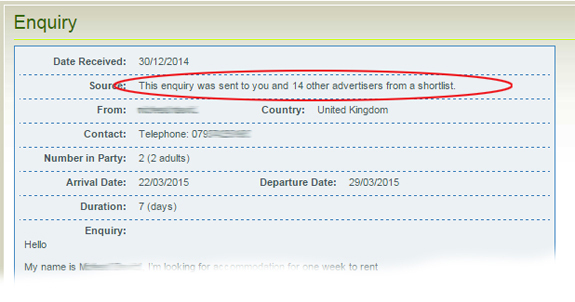 You cannot opt out of receiving these – nor would you want to if you are serious about marketing your holiday rental! In the case of the third type of enquiry – Additionals – you can choose whether you would like to deal with these by selection ‘None’ or ‘Only when available’. You must complete this section in order to get your listing live on site but you can edit this at a later date if you wish. So how do you decide whether or not to opt into receiving these additional enquiries? It may help if we explain each type of enquiry and how they are generated. The holiday maker has spent some time browsing the site and using the Refine your Search section until they have found the ideal self-catering holiday home, lodge or cottage for their needs. This may, for example, be decided by dates, number of bedrooms or bathrooms, location, whether the home is pet friendly or the types of facilities available. Guests can even look for specific items like an open fire, hot tub or off street parking. Direct enquiries are likely to be the easiest to convert to bookings and should be followed up as quickly as possible. We recommend you reply well within 24 hours and if you are not able to answer immediately, set up an automated reply confirming you’ve received the request and will be in touch at the earliest opportunity. Leave your reply too long and your potential guest may start looking at alternatives and you’ve lost your advantage! Marked ‘This enquiry was sent to you and X other advertisers from a shortlist’. In some cases, holidaymakers may be a little more flexible in their requirements for their holiday home accommodation in the UK. They may even be undecided on which part of the country to visit. As they are taking a look at the selection of homes featured on Direct Holiday Cottages, they can add the properties that they are interested in to their shortlist. Once they have a number of properties in their shortlist, they can compare different features side by side – perhaps narrowing down their choices at this point. From here they can complete one quote request which is sent to all the holiday homes on their final list at the same time. Shortlists may contain homes at different locations throughout the UK, of differing sizes and offer a variety of features. When you receive the enquiry, you will know how many properties were included in the shortlist – giving you an idea of how many homes you are competing with – but you may need to do a little more questioning to help you find the best way to win the booking. What you DO know is that they have seen your details and your home DOES have something that made them include it in the shortlist. Again a prompt response could give you the advantage needed to secure the booking. These enquiries are generated at the request of a holidaymaker. Following their request, their original enquiry details are forwarded to a shortlist of alternative holiday accommodation that they may not have seen on their first search but still matches their criteria. This redistributed enquiry will only be shared following a 24 hour delay, in order to give the original recipient every opportunity to respond to the original direct enquiry. If a holidaymaker’s initial enquiry has not resulted in a booking or the property owner has not responded, redistributing their details as an additional enquiries helps to keep visitors shopping for alternative properties within Direct Holiday Cottages portfolio rather than searching elsewhere. How are additional enquiries generated? 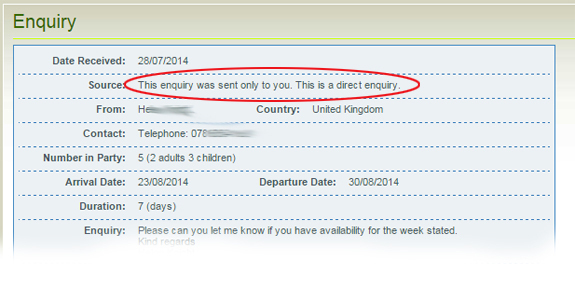 Where a holiday maker has requested a quote from a single property they will then be taken to the following screen. Here they can choose to return to the property listing, continue their search for alternatives, or request that the enquiry is forwarded to other properties matching their original requirements. If they request their details are forwarded, an ADDITIONAL enquiry with the same information as the initial contact will be then sent to a maximum of 25 owners who have opted to receive them. If more than 25 holiday homes match the criteria, the ‘shortlist’ will be selected at random. The shortlist will only be compiled from advertisers that show availability for the requested dates. They are sent ONLY at the request of a holiday maker and only to those owners who wish to receive them. To keep the system working efficiently, we do request that you respond to ALL additional enquiries – even if it is just to say the dates are no longer available in your home. When responding to an ADDITIONAL enquiry, do remember your potential guest has not necessarily seen any information about your home, but you have been asked to quote because your home matches the criteria of the first contact to the site. A little extra effort may be needed to convert these enquiries to a booking but if you have the time to deal with them they could provide an extra source of income. You may wish to contact the enquirer for more information before quoting. A telephone call could prove useful if a number has been provided. Make it clear in your reply which home your quote refers to with a name and your Direct Holiday Cottages ID number. And remember – if you use the branded response built into the system, your property ID, an image and a link back to the relevant listing page is already there for you! Direct Holiday Cottages use this fair and transparent approach to give holiday home owners not only the choice to deal with the level of enquiries they wish to receive, but also a clear idea of how many properties could be competing for the business. There is no ‘behind the scenes’ selling hidden from owners. All enquiries are submitted from visitors to the site – never generated by the site itself. All that you need to do now is decide which types of enquiries you’d like to deal with. Direct and shortlist enquiries are both good quality leads and may well provide all the business you require for your holiday rental in the UK. If this is the case select ‘None’ against the additional enquiry option and concentrate your efforts on dealing with these targeted enquiries as quickly and efficiently as possible. Additional enquiries do perhaps need a bit more time and effort to secure bookings, so they won’t suit everyone, but if you’d like to work with these extra leads select ‘Only when I have availability’ and keep your calendar on site updated. If your circumstances change during your 12 month subscription, you can log into your Owners Area and update your contact preferences accordingly. If you’d like to find out more about selecting your enquiry preferences or using the built in response system to send your replies, then give Sarah or Tracy a call during office hours. If you own your own holiday home in the UK – whether it’s an apartment, house, lodge or cottage – contact us to find out more about advertising on Direct Holiday Cottages. Or simply select ‘Advertise your Holiday Cottage’ to get started today. This entry was posted on Friday, May 1st, 2015 at 9:00 am	and is filed under Advertising your holiday cottage, Direct Holiday Cottages, Holiday Cottages in the UK, Marketing your holiday cottage, UK Holiday Cottages. You can follow any responses to this entry through the RSS 2.0 feed. You can leave a response, or trackback from your own site.